Welcome to another post from our monthly funding statistics series. Here, we talk about the most popular investment methods used by our customers in July and how this has changed since the previous month. The total amount originated totaled €5,421,345 in July, another record-breaking month for Bondora. 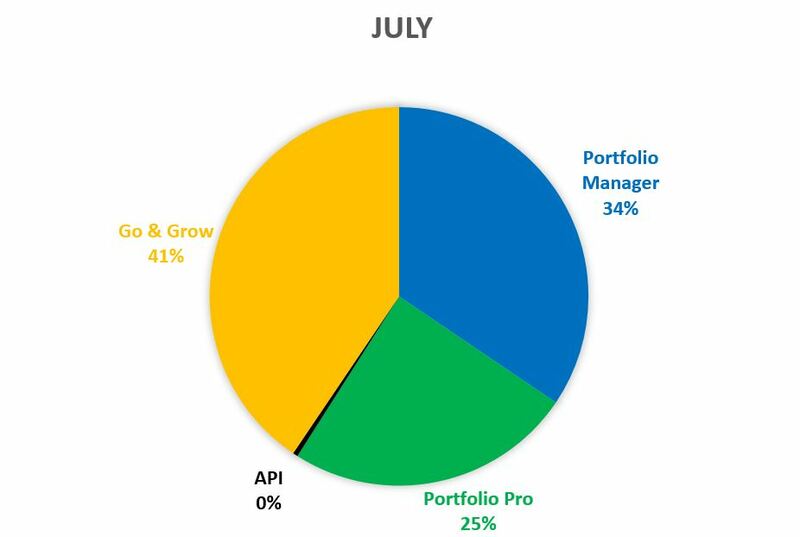 In line with the trend of the previous month, Portfolio Manager decreased in popularity in July, and Portfolio Pro remained relatively static. Still standing at 25% of the total investments, Portfolio Pro accounts for 17% of the total compared to February. Portfolio Manager’s share now accounts for 34%, significantly lower than the 64% share it held in March. Go & Grow is still leading the way at 41% of the total share and just under €2.2M. This is up 3% compared to June and 17% compared to May. At the beginning of June, Go & Grow was made available to all new and existing investors. 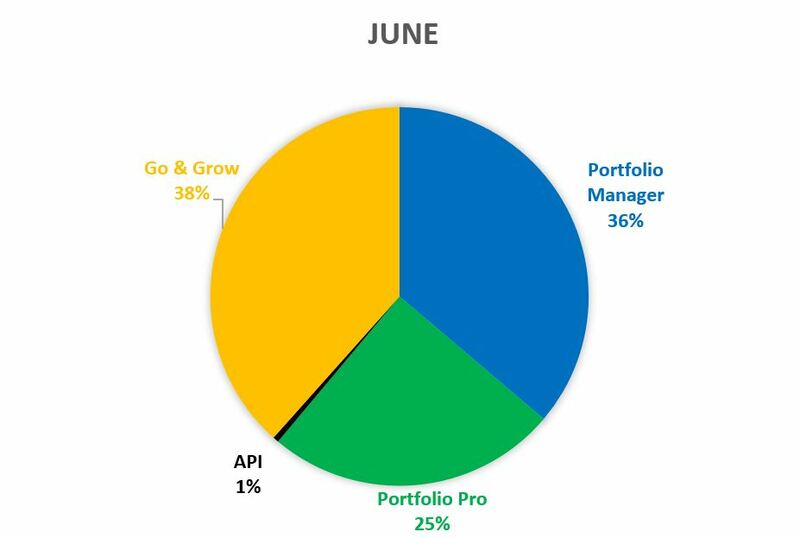 The percentage of investments made through the API increased slightly to 0.43% of the total (rounded figures in the pie charts) – due to the technical skills required for this option we do not expect to see this fluctuate widely on a monthly basis, as seen with the other investment options. Look out for our upcoming post where we discuss where the highest percentage of investments have been made, breaking it down by country, risk rating and durations. Go & Grow – Go & Grow is an incredibly simple and automated tool that allows you to earn 6.75%* p.a. on your investment and gives you faster liquidity. This is for the people who want lower risk* and “no-hassle” investing with a predictable net return. Find out more about Go & Grow here. Portfolio Manager – Select a strategy ranging from ultra-conservative to opportunistic, add money and you’re ready to go. No further management is required as Portfolio Manager takes care of everything for you. If you want to leave a certain amount of cash on your account that won’t be invested, go into your settings and adjust the spare cash balance slider to your desired amount. It’s easy! For further comparisons between the two, check out our video on the topic here. *As with any investment, your capital is at risk, and the investments are not guaranteed. The yield is up to 6.75%. Before deciding to invest, please review our risk statement or consult with a financial advisor if necessary.